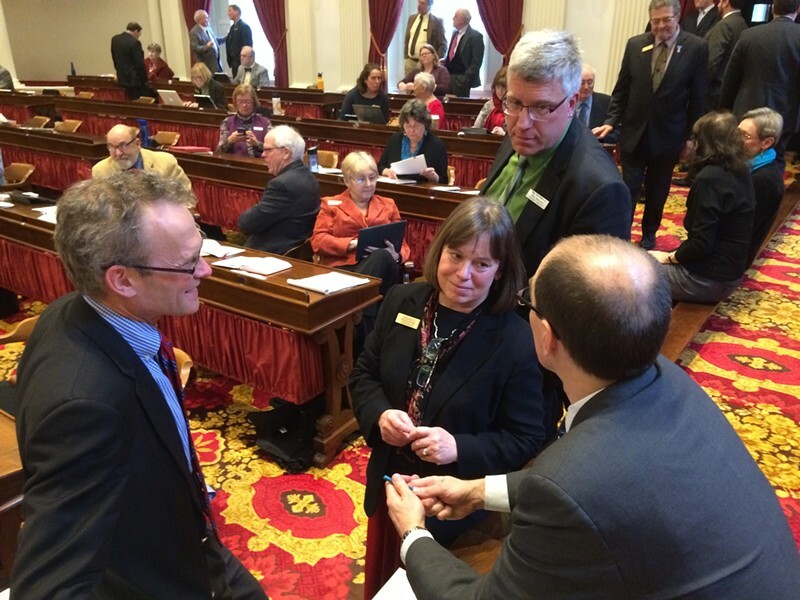 Reps. Willem Jewett (D-Ripton), Helen Head (D-South Burlington) and Tom Stevens (D-Waterbury) confer with Damien Leonard, one of the legislature's lawyers, about the paid sick leave bill. The House voted 81-64 Wednesday to go along with the Senate version of a bill that would require employers to offer paid sick leave to their workers. Lawmakers gave the bill final passage only after extended debate. The vote fell largely along party lines, with most Democrats supporting the measure and Republicans objecting. Gov. Peter Shumlin has already pledged to sign the measure. Rep. Tom Stevens (D-Waterbury) helped craft the legislation, which the House first passed in 2015, and defended the revised version. Noting that 60,000 working Vermonters don't have paid sick leave, Stevens said: "This bill is meant to show some compassion. This is not an attack on small businesses." Rep. Loren Shaw (R-Derby) was part of the chorus of critics who challenged Stevens' assertion. "I don't think they know what businesses really go through," Shaw said. The bill mandates that all employers provide paid sick leave beginning next January, but allows businesses with five or fewer workers an extra year to comply. New businesses also get a one-year exemption from the requirement. The mandate is phased in, with the maximum amount of leave set at three days until after 2018, when it would go to five days. It doesn't apply to employees who work fewer than 18 hours or who are 18 or younger. Three lawmakers had submitted potential changes to the bill, but withdrew them because they recognized they had insufficient support for passage. Rep. Oliver Olsen (I-Londonderry) peppered House General Affairs Committee chair Helen Head (D-South Burlington), lead defender of the measure, with questions about how the bill would apply to various categories of employees who work for compensation other than hourly wages. She repeatedly responded that the committee hadn't taken testimony on the questions he raised. "I am speechless," Olsen said. "This legislation has not been fully vetted." He asked that the bill be sent to a House committee for additional work. His request failed 87-58. Rep. Cynthia Browning (D-Arlington) criticized the bill for going well beyond providing paid sick leave. She noted that the bill would allow an employee time to take a family member to a routine medical appointment. Browning also criticized the bill for proposing a study of the requirement's impact on small businesses. She called the process backward, saying the research should take place before the legislature enacts the law. Annie Accettella, director of the paid sick leave campaign, sat at the front of the House chamber watching the debate. With final passage of the bill, she said, Vermont becomes the fifth state to enact a paid sick leave mandate. "This is part of a broader movement," Accettella said. The message, she said, "is: This is the kind of state people will want to live in because we have these values."